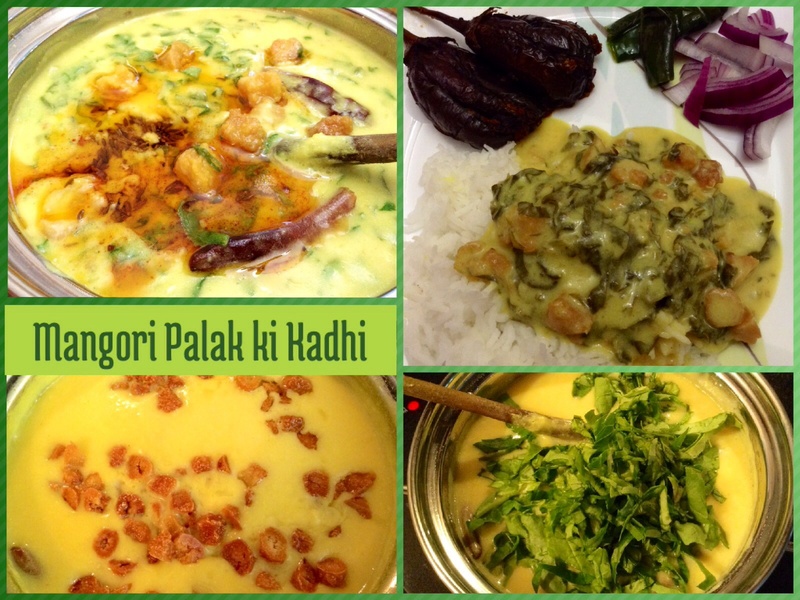 One of our family’s all-time fav hot, steaming, melt in the mouth, PAKODE WALI KADHI…Mmmmmmmm!! 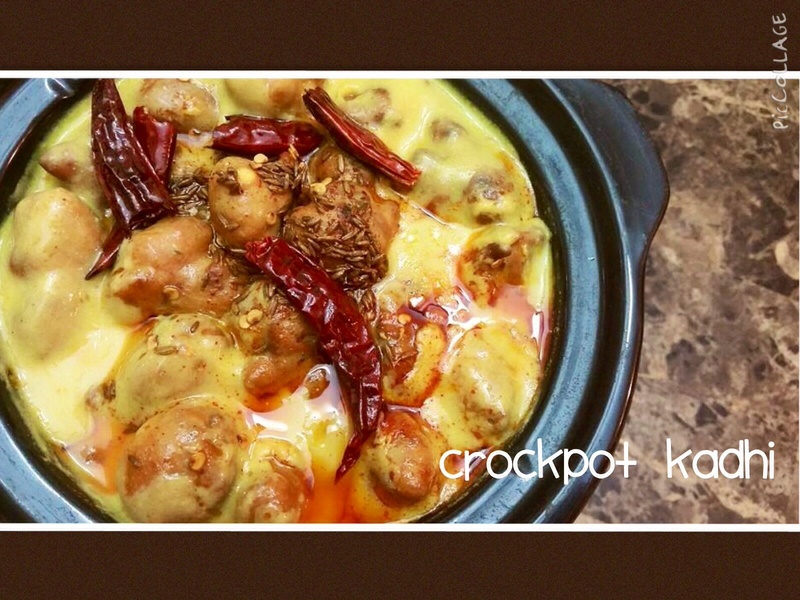 This is my great grandma’s family recipe for kadhi…. A little out of the box….but all the same, give it a try! It’s Unique eature: the pakoris are not deep fried, light as air and melt in the mouth soft!! Heat ghee, add 1/3 tsp ajwain and 1/3 tsp methi daana along with 2-3 dry red chillies. Then add 2 cups of very sour yoghurt(you can add salt in the yoghurt and keep overnight) which has been blended with 4 heaped tbsp besan, salt, haldi and about 6-8 cups of water. After the first boil, cook on low flame for at least 1 1/2 hour or till desired thickness is reached. Blend about 3/4 cup besan with salt, chilli pwdr, 1 tsp baking powder and water into an extremely thick batter. Keep aside for about 15 minutes and then mix thoroughly (3-4 min) till light and fluffy. Take a flat omlette pan, heat 1 tbsp oil and slowly drop small drops of the batter(I use a spoon) cook on medium high and flip once so as to cook both sides. 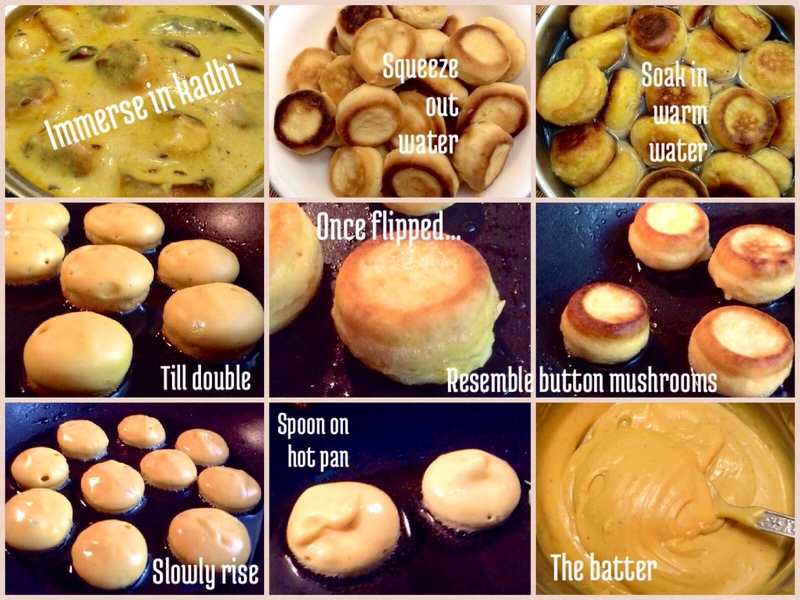 When they are cool, soak them for about 10 minutes in salt water, then squeeze and add in kadhi. 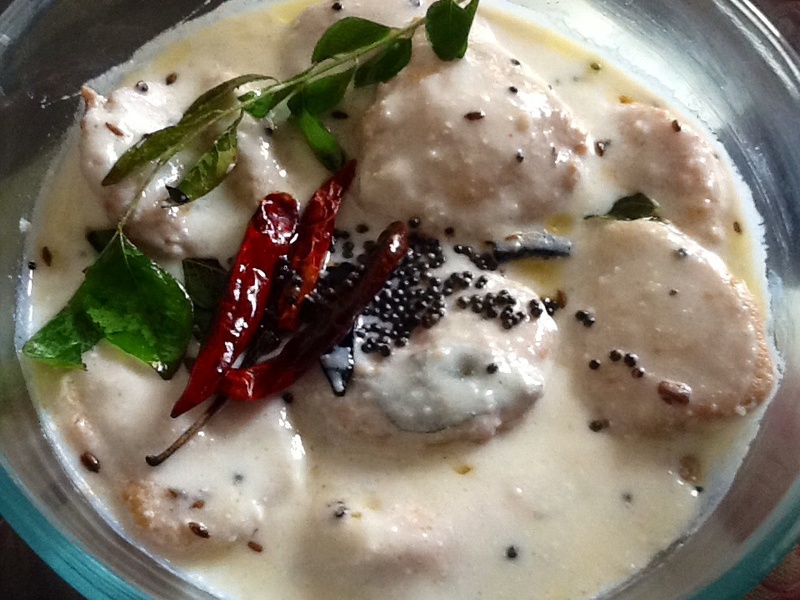 Just before serving, bring kadhi to boil and simmer for 5min so that the pakoris are heated through. Do not over cook at this stage as the pakoris are delicate! I also like to add a tsp of crushed kasoori methi towards the end. Lastly just be fore serving give hing, jeera, lal mirch tadka. 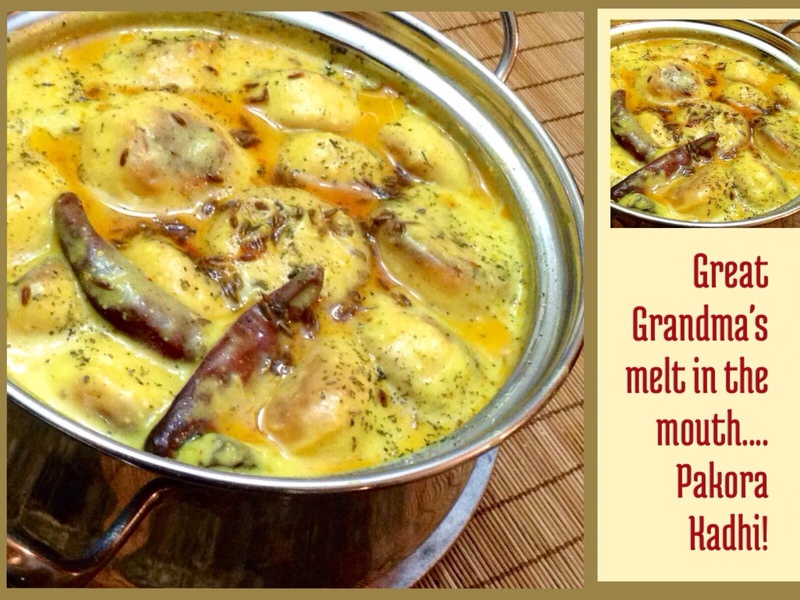 serve with hot rice / Phulka/ Haath ki Roti! 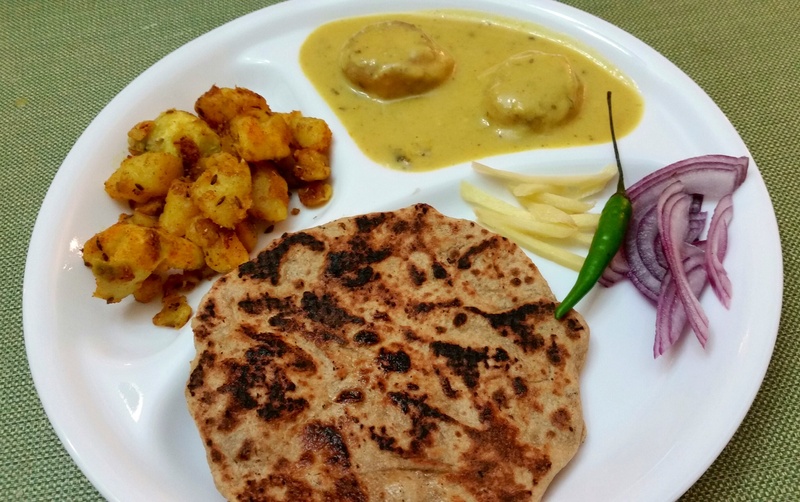 The haath ki roti, was my Dadima’s special with kadhi! You put a few drops of ghee/oil on your palm and then take a ball of dough. Using your two palms you shape the dough by clapping your hand repeatedly….till you have a round even shaped roti. Step by step collage on how to make the pakoris! Trying this for lunch today. Hi! can I use greek yoghurt for this recipe? You could, just add more water to the recipe. Looks yummy.. Trying this for lunch tomorrow .. Is it ok to skip the soda ? There is no soda in the recipe, I use baking powder…not soda. Tried this recipe…curry was yummy , loved by everyone at home..but the pakodas turned out hard for me..:(.my baking powder had crossed its expiry.. I guess that must be the reason why the pakoris turned out to be hard. For soft pakoris, apart from adding baking powder, you also need to whip the batter considerably. I imagine the pakodas can also be made in an appe pan. will give this dish a try today. Thanks for sharing an heirloom recipe!